This past week has been a busy one and also a little reminiscent to the days when I was making frequent trips to the big city for medical follow-ups. Over the past two weeks, my mom and I have made four trips to Toronto. Thankfully, three were for the Cityline Makeover and only one was for a medical follow-up. Mom and I arrived at the Cityline studio at 8:30am to be prepped for the taping. Our hair and make-up was completed by 9:30am and the show’s taping began around 10am. Mom and I were backstage for the majority of the show so I’m not sure exactly what was occurring on stage. What I do know is that the show focuses on topics about life after cancer. In addition, the entire audience consisted of cancer survivors and caregivers which was really special and truly a celebratory show. 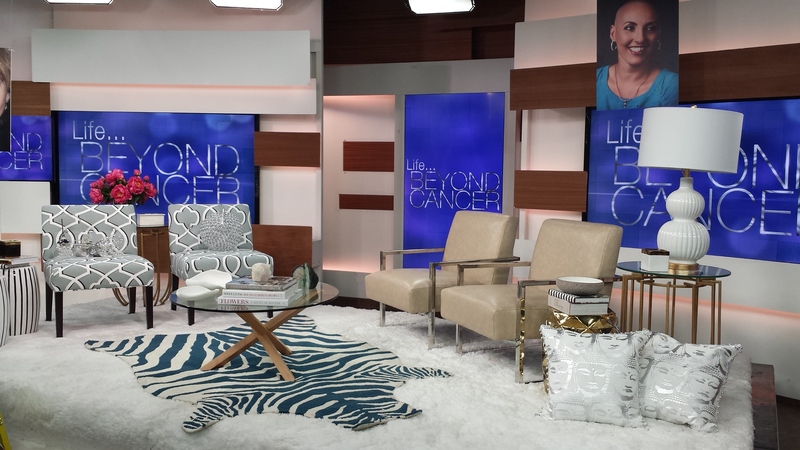 The set was glamorous and I heard that it was one of the nicest sets they have had on Cityline. I managed to snap a shot of it before the audience was seated. Around 10:30am, Janice (stylist) dressed my mom and me in our outfits. We were revealed to the audience around 12:30pm. Coming out onto the stage was pretty exciting and I was able to speak on camera with Tracy Moore (Cityline host) for a brief moment. I was both nervous and excited. The trickiest part was knowing where to look because there were cameras and screens all over the place. After this experience, I have a larger appreciation for the T.V and movie industry. Hurry up and Wait is a common phrase in the industry and after having the two days of filming for Cityline, I have learned that you have to be very patient but also be able to act on the fly. It was a flurry to get everyone ready and then we all waited until it was our time to go on the stage. I am looking forward to watching the final cut tomorrow (Tuesday March 31st) when it is aired on Citytv. The second big thing that occurred this week was experiencing my first colonoscopy. Before being diagnosed with the CDH1 mutation, I figured a colonoscopy wouldn’t occur until I was over 50. But since colorectal cancer is loosely linked to CDH1, I am starting screening now. The actual procedure was a walk in the park, however, the prep for the procedure was less than pretty. The day before a colonoscopy is performed you get to experience a forced detox of your body. Your diet is clear fluids all day and then a flush (pun intended!) throughout the evening. I won’t go into all the details but I will say, I was thankful for my ipad and smartphone. The clear fluid diet was difficult as a stomachless person. I still cannot tolerate a large intake of sugar and especially if there’s nothing else in my “tube”. So I ended up drinking chicken and beef broth all day. I also drank water downed juice. Within the first 3 hours of waking, I started to feel like a space cadet – fatigued, and just not 100% with it. I could function but definitely was not on my “A” game. The staff meeting that I ran was probably a good one to remember. It was surprising to see how much your body changes without sustenance. During the same appointment, I also underwent an endoscopy with dilation. I haven’t noticed too much of an much issue eating since the last endoscopy in November but since the gastroenterologist was going to look at the anestemosis, he said if it needed dilation, he would perform one. After awakening in the recovery room, I was told that a dilation was performed and some small polyps were removed from my colon. The polyps will be sent for investigation but the gastroenterologist assured me that they will be a non -issue. Yay! Since this appointment, I have noticed a significant improvement in eating so I guess the stricture wasn’t 100% gone. Here in Ontario it is the season where our maple syrup trees are tapped to create maple syrup. Often, there will be “sugar bush” festivals where you can go see the trees being tapped and eat pancakes. Inspired by the season, I decided to make some pancakes for myself to eat at home. Prior to surgery, I really enjoyed eating pancakes. After surgery, pancakes are something that I have tried numerous times with limited success. I was not willing to accept that they may be something I shouldn’t be eating anymore. I have tried at least five different recipes and all come out with the same outcome – first nausea, followed by extreme fatigue and the sweats. I have now deemed this feeling, “pancake brain”. This time I ate two pancakes and pancake brain lasted about an hour. The same thing still happens with me with other foods heavy in wheat flour. If anyone has a good pancake recipe that they can tolerate post gastrectomy, I’d love to know! Last blog post I had mentioned that my mom and I were planning on going to Philadelphia to attend the latest conference on hereditary diffuse gastric cancer (HDGC). Our trip has now been booked and I am looking forward to connecting with others who have also been affected by CDH1 and HDGC. I’m hoping to also meet up with some people who have been following my blog. I can now count down the weeks to the one year mark instead of counting up the weeks post recovery. It’s amazing how fast time can fly! 10.5 Months – I’m going to be on TV? Prior to surgery, I’ve always thought it would be cool to be a contestant on the TV show, Survivor. I have watched all the seasons and figured I could pull it off. I was athletic and thought I might have a chance at the social game. However, after surgery, I’m not so sure I would do well with the not eating part of it. Recent events have allowed me to be on television in a whole different light. A few weeks ago my mom entered us into a “Cancer Survivor Makeover” competition for the T.V. show “Cityline“. This is a Canadian National daytime T.V. show that focuses a variety of lifestyle topics. I was unaware of this until she told me she put our names forward. Next thing I knew, we were finalists, and then we were winners. We didn’t think we had a chance but I suppose our story is unique. Our makeover took place last week Wednesday. 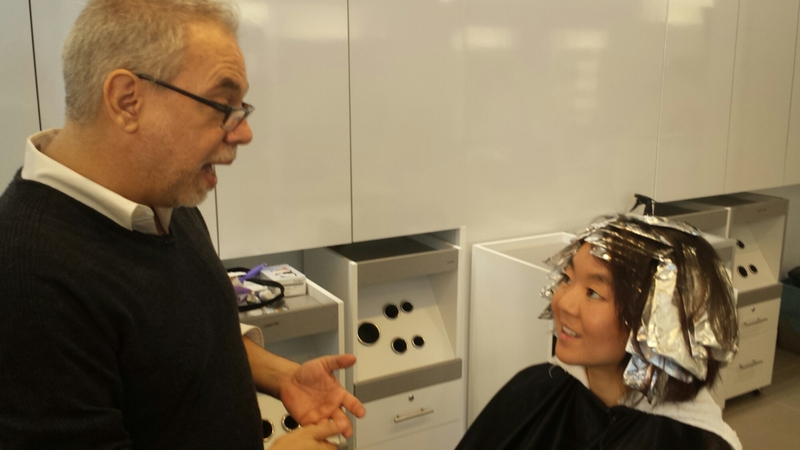 We arrived at the Fiorio Salon bright and early and met the show’s producer, Mary Benadiba, who let us know how the day was going to run. We would be interviewed, have our hair and makeup done, as well as be outfitted with new clothing. We got to spend some one on one time with, Bill Rowley, Kerry Battersby, Dino Dilio, and Janice Meredith (hair, colourist, makeup, and stylist, respectively). These people are experts in their fields and a few of them make regular appearances on the show. I don’t think I stopped smiling the entire time. I received some good tips about how to dress for my new body type as well as new hair and makeup tips. There was a lot of footage taken and it is going to be spliced together for a 2-3 minute segment during the show which is taped on the 24th of March. My mom and I are also going to be present during that show and are going to do a big reveal at the end in front of the audience and cameras. I’m both nervous and excited to see how it all comes together on the 24th. If you live in Canada and want to see it when it airs, check out the Cityline broadcast schedule here. For all others, it may be posted on there webpage after the show airs. The most important thing is that I wanted to raise awareness that stomach cancer affects young people as well as older people. Mom and I had no idea what was involved with our makeover, if there would be other survivors there as well, or that we would be on TV. We also didn’t know we would be interviewed and both wished we prepared better. I hope the final cut of the video spreads awareness about hereditary diffuse gastric cancer and the CDH1 genetic mutation. Nonetheless, it was a wonderful day to remember with my mom and definitely an experience of a lifetime. Thanks Cityline! I was banking on our trip to Banff for my snowboarding fix for the year but unfortunately, Brandon and I had to back out of the trip last minute. The snow here is quickly melting now and I knew that if I didn’t get out at least once this season, I would be regretting it. So on Saturday we went to a small hill about an hour and a half away. 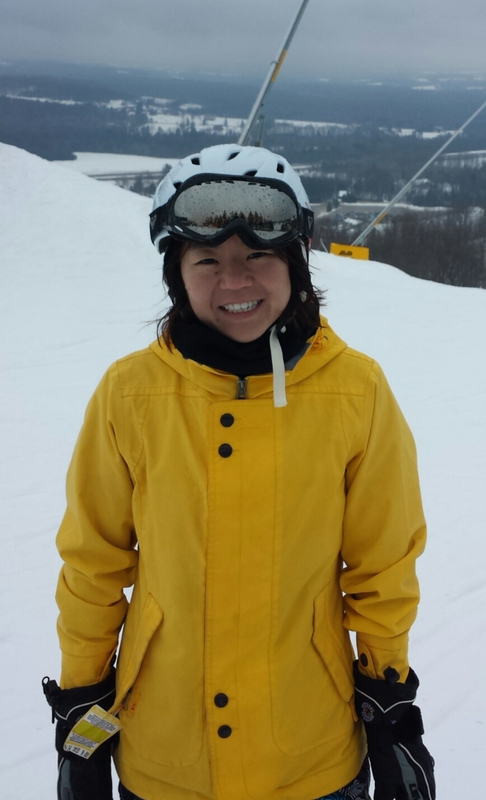 The biggest thing I was afraid of was not being able to get up after buckling myself into my snowboard bindings. It takes a fair bit of core strength to push yourself up off the ground after getting off the lift. But lo and behold, I didn’t have any issues. Big win! I also was afraid of falling going down the hill because I still feel where the incision was made with quick muscle contractions and a fall would likely feeI like I was tearing in half. So I took it easy. I did notice that my technique had to change going down the hill but that makes sense given I am 20lbs lighter than I was last year. All and all it was a wonderful day. I’m really happy I can cross another post surgery activity limitation off my list. Whenever I try an activity I used to do before surgery but haven’t tried after, it’s almost like I’m doing it again for the first time. You are a little unsure if you are going to be okay and when you finish doing it and you are okay, it feels like another big victory. I think the next adventure will be returning to the baseball diamond this spring. I haven’t swung a bat, pitched, or thrown a baseball since summer of 2013. I’ve played baseball all my life and I’m pretty pumped to see what the season holds. In terms of energy level, I think it’s slowly returning. I have super energy days some days and incredibly exhausting days other times. It’s like a roller coaster. A few weeks ago I was hit with a very minor cold that lasted three days and just about put me out. Things like this never caused an issue before but now it takes a lot out of me. I’m looking forward to when I’m fully recovered and this no longer occurs. Two weeks ago, I met up with a GI Oncologist closer to home. The appointment was arranged by my genetic counselor from Toronto almost 7 months ago. I was unsure about the purpose of the appointment but I figured it too much follow up with specialists never hurts. Plus, I may be able to educate him about CDH1 since it is less known about in my region. I now realize that it was to connect me with a network of resources in town. I will be seeing him annually which is nice because I have a feeling I will be discharged from my surgeon’s office and that team in May. In about a week, I will have my follow up with the gastroenterologist who performed my dilatations to make sure everything is healing well along with my colonoscopy to screen for colon cancer. Again, screening is always reminds me I’m not clear of all cancer risks but at least the bigger one you can’t screen for is gone. I can tell you that I’m really looking forward to the detox that will occur before the procedure. Haha. Recently, Dr. David Huntsman and his research team released updated stats for CDH1 and associated cancer risks. It actually lowered my lifetime stomach cancer risk but given my family pedigree and my pathology results…..I’m glad my stomach is gone. I’m eating well and I can eat….wait for it….bread! But not all types. I’ve discovered that bread made with sprouted grains (i.e. Ezekiel bread) is one of the only few I can eat so far. I can’t begin to tell you how much money I’ve spent on various loaves of bread only to find out that I don’t digest them well. Trial and error right? My portion size is slowly growing and now is similar to a snack size which is perfect because I can purchase a Tim Hortons snack wrap for $1.99 and call it a meal. Besides bread the number one food that I miss and I keep trying to eat is ice cream. I tried a spoonful last week and thought I was being kicked in the gut for the next half hour. Not fun but for sure worth a try. You bet I’m going to try again later. I still don’t tolerate large quantities of sugar well and I try to limit it to 11 grams or less. I can eat it but sometimes it results in a nice colon cleanse. Haha. Sorry if that was too much information but my fellow stomachless friends can likely contest. On April 23rd there is an event hosted by No Stomach for Cancer in Philadelphia, PA. My mom and I are hoping to fly down there and connect with people who are also affected with CDH1. I have never been to Philadelphia so it will be an exciting getaway as well. If any of you will be attending, it would be fantastic to meet you all face to face! Until then, keep smiling, look at the bright side, and stay awesome!